Philip C. Wiener, Evan J. Friend, Ruchika Bhargav, Gregg S. Pressman. Albert Einstein Medical Center, Philadelphia, PA, USA. OBJECTIVE: We sought to understand a common limitation of color Doppler in assessment of mitral valve regurgitation (MR). We found an un-described MR signal, the horizontal splay (HS) across the valve, occurring in transthoracic echocardiography (TTE) often read as non-severe but revealed as severe on transesophageal echocardiography (TEE). METHODS: We reviewed TEEs from 2013-2018 of patients with TEE-identified severe MR. TTEs from each patient were reviewed. We included studies with HS signal was seen in multiple views (apical 2-chamber, 3-chamber, 4-chamber; and parasternal long-axis) and where MR was interpreted as <= moderate in severity. We excluded cases with vegetation or prosthetic mitral valves. RESULTS: We identified 10 examples of HS MR signal on TTE that was reported as non-severe but was then shown to be severe MR on TEE. 9 cases had primary MR while 1 case had secondary MR. In those with primary MR, the posterior leaflet was affected in 8 (all cases involved P2) and the anterior leaflet (A2) was involved in only 1. In all cases, the MR jet on TEE was highly eccentric (“wall hugging”). 7 jets were directed anteriorly and 3 posteriorly. 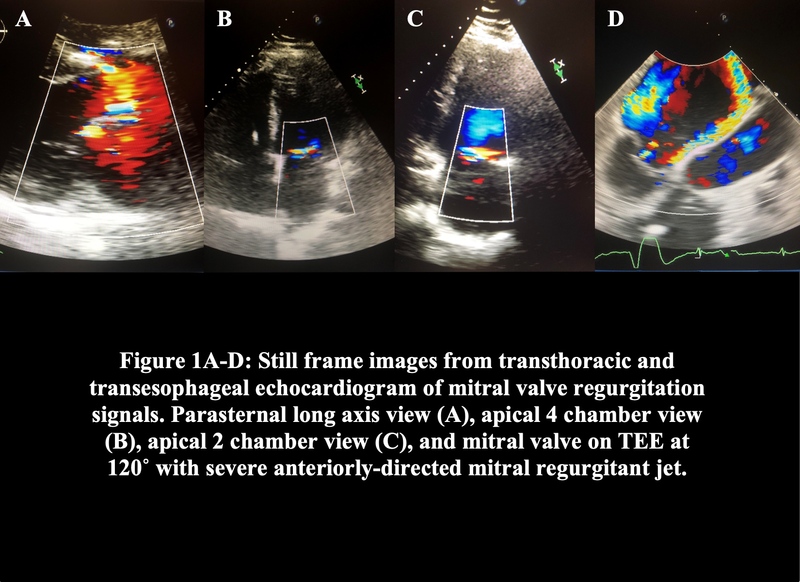 CONCLUSIONS: There are several quantification methods used in assessment of MR including jet area to left atrial area ratio, proximal isovelocity surface area (PISA), and calculation of effective regurgitant orifice area (EROA). However, these are limited to a discrete MR signal. Qualification of MR using color Doppler on its own can lead to underestimation of the severity MR. Patients with severe MR and an eccentric jet may demonstrate a non-physiologic HS MR signal. This series sheds light on the limitations of color Doppler imaging in assessment of valvular regurgitation.